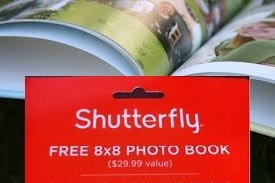 Free 20-Page 8x8-inch Shutterfly Hardcover Photo Book with the given coupon code. At Shutterfly, millions of people store, enjoy and share billions of photos. They help you turn the photos you love into award-winning photo books, meaningful cards, imaginative photo gifts, home decor, personal websites and so much more. To get free shipping with $39 and above order, use coupon code SHIP39.